You've just discovered your first few grey hairs and you have no idea what to do...our pro is here to help you understand the best ways to deal with this color change. Getting a few grey hairs is a completely natural process. 'This is due to the de-pigmentation of your hair. When this happens, it loses its color pigments, meaning the hair turns white. Greys tend to appear around a certain age period however can also appear much earlier with certain individuals. Each person has their own genetic timescale which determines when you will start going grey. Other factors which can cause greys are stress, emotional tolls and even some illnesses'. It's fairly simple to deal with grey hair. 'There are two options available. Firstly, you need to decide whether you want to stick with them or cover them. If you choose the former, start by using targeted products for your greys if your head is covered by 50% or more. If you only have a few grey strands, you can continue with your regular haircare routine. On the other hand, if you want to hide your grey, head straight to your salon. They will be able to make a professional diagnostic, listen to your requirements and create a bespoke colour varying from temporary to permanent'. 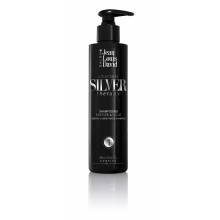 Our advice: Look after your greys with products from the Silver Therapy range which was made for white hair! Every three shampoos, wash your hair with Energy and Shine Shampoo which will boost your colour and enhance its vitality whilst adding a glossy sheen that will last for days on end. My grey hair is turning yellow: what can I do?